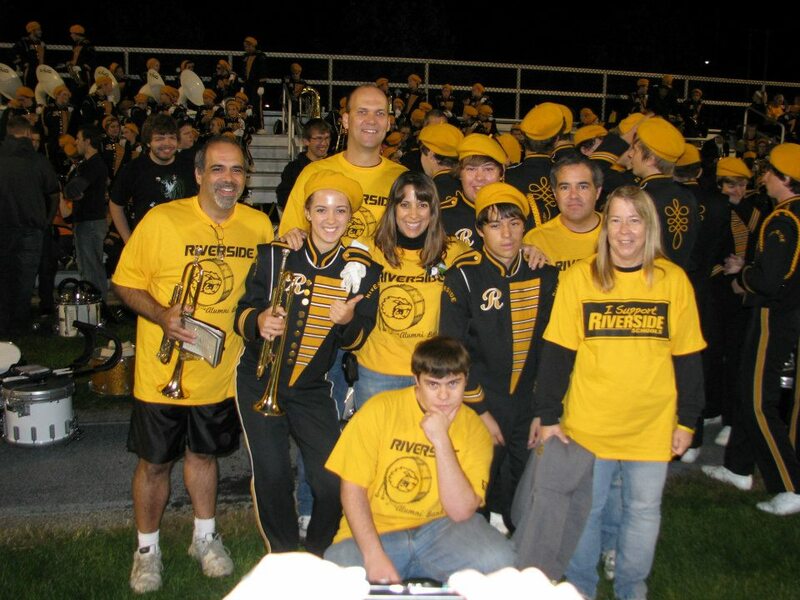 The Riverside Alumni Band performs with the Riverside Regiment every Homecoming. We perform during Pregame and Halftime. We invite anybody who has ever played an instrument for the Beavers, ever led one of the bands over the years, or may have a kid in the district and played an instrument in your high school band. The Vaccariellos and Lindroses pose for their annual family photo after halftime. You will find us rehearsing on the side of the building starting at 5:00 p.m. for rehearsal. Even if you can not get there at 5, please join us later. We don't have to move once we are in formation on the field. We also have limited our playlist for the performance in order for alumni to be familiar with the tunes. If you need an instrument, music or are a percussionist, call or text Mike Vaccariello at (440) 479-2850 or email at mjv111@aol.com. The Alumni band will play as long as the Regiment plays. We have played in snow and bad rain. We have increased the number of returning alumni over the years and consistently get more than one hundred in the alumni section. Please think about joining us! Check out the 2017 performance below.